Madeira’s fishing grounds are known to be particularly attractive to anglers who are genuinely interested in finding and catching some of the truly special big game fish that frequently prowl across the Madeiran seascape at certain times of the year. The variety of species is huge and while Dorado fishing, there is always a great likelihood that sizable game fish be caught during a fishing trip with the “Dream Catcher”, a 31 ft custom built American Rampage 31, which permits nearshore as well as offshore fishing. The “Dream Catcher” charter boat offers seating capacity for 5 persons and ample space for anglers on the flybridge. With the help of the GPS and a highly sophisticated fishfinder, anglers on board will hardly have any difficulty in getting orientated properly. Fortunately, any useful fishing equipment will be provided. There are a lot of opportunities to actually catch a Dorado while trolling for other fish, such as the Blue Marlin or Bigeyed Tuna. 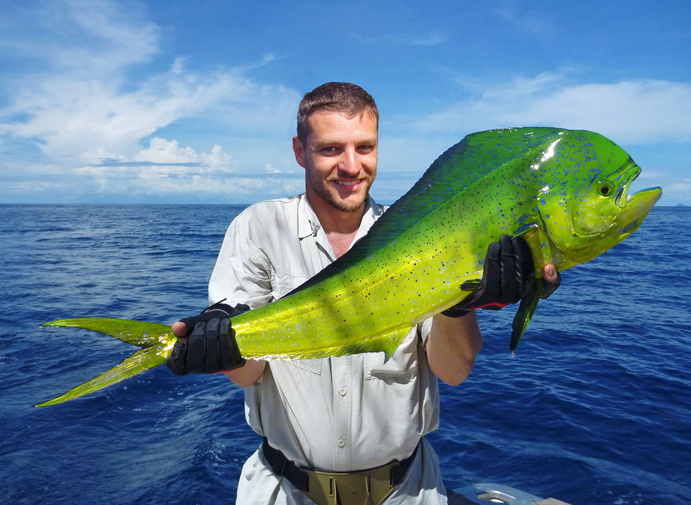 Dorado (also known as Mahi-Mahi) occur in larger schools and the unique beauty of their appearance is what makes them so extremely attractive to fishermen. While most Dorado do not surpass the 30-pound weight mark, there have been some rare cases of dorados weighing up to 85 pounds. An ideal fishing trip with boat charter Dorado fishing will allow anglers to take advantage of the great amenities for their dorado sportfishing, such as a fighting chair, artificial lures and live baits for the ease of customers’ fishing activities on board the “Dream Catcher”. 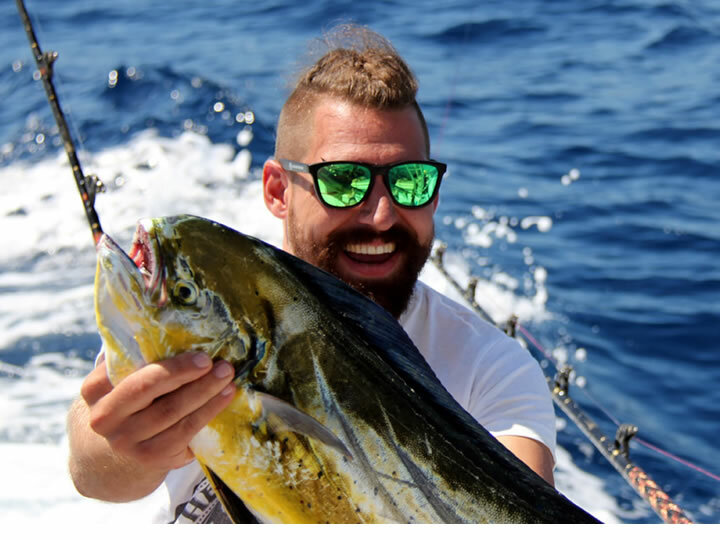 Here the very helpful skipper and his first mate put a lot of emphasis on giving proper guidance to the anglers on board, so as to fully enjoy a fascinating and thrilling fishing event, as there are many fishing opportunities for Dorado. In Madeira Dorado may be spotted and caught nearshore, but for the larger Dorado the boat charter Dorado fishing with the “Dream Catcher” will definitely head for the offshore Dorado fishing spots, where their numbers are plentiful. Their unique shape (resembling that of a dolphin) in combination with their greenish-blue golden appearance make the Dorado very appealing to the observer. Yet, as soon as the Dorado is dragged out of their natural habitat, they lose their precious colourful decor which turns into a watery blue. Dorado have excellent swimming capacity and develop speeds of up to 92 km/h. For optimal Dorado fishing no heavier than medium sized tackle should be used, so as to allow the fish to fight on a fair basis. 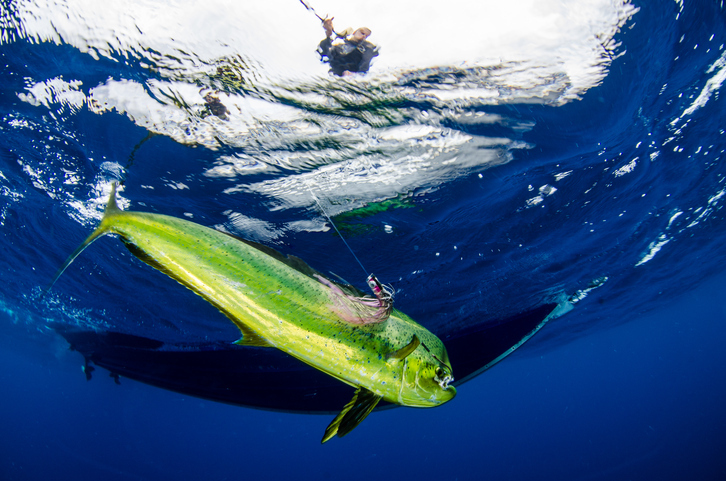 Dorado will eat almost anything so 10-15 inch artificial lures like rubber skirts or teaser birds on trolling lures for Tuna or Wahoo will be just fine for the Dorado. Since they respond very well to baitfish, sardines or mackerel will make perfect natural baits. Whatever the choice, it is important to remember that Dorado are determined fighters, so anglers should brace themselves for a tough battle. However, dorado will compensate them with numerous incredible jumps, a colourful breathtaking spectacle which will be impossible to forget.